Especially with shows like Who Do You Think You Are?, celebrity genealogy is all the rage right now. There’s also a saying that if you want your genealogy researched, run for public office. With my access to the Family History Library and various subscription sites that I can use there for free, I plan to expend no money. How far can I go for free? Bernard “Bernie” Sanders was born 8 September 1941 in Brooklyn to Eli Sanders and Dorothy Glassberg. This information came from Wikipedia, and I continued on my own from there. I tried the 1940 US Census first where I found Eli and Dorothy Sanders with their son Lawrence living in Brooklyn. The census said that Eli was naturalized, so I looked for that on Ancestry. 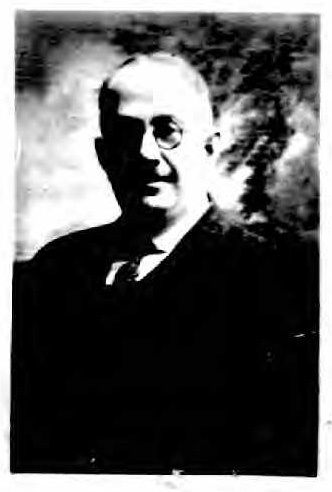 I found a naturalization for Elias Sanders from the 1920s before he was married, so I could not yet be sure it was the right person, but I held on to it. 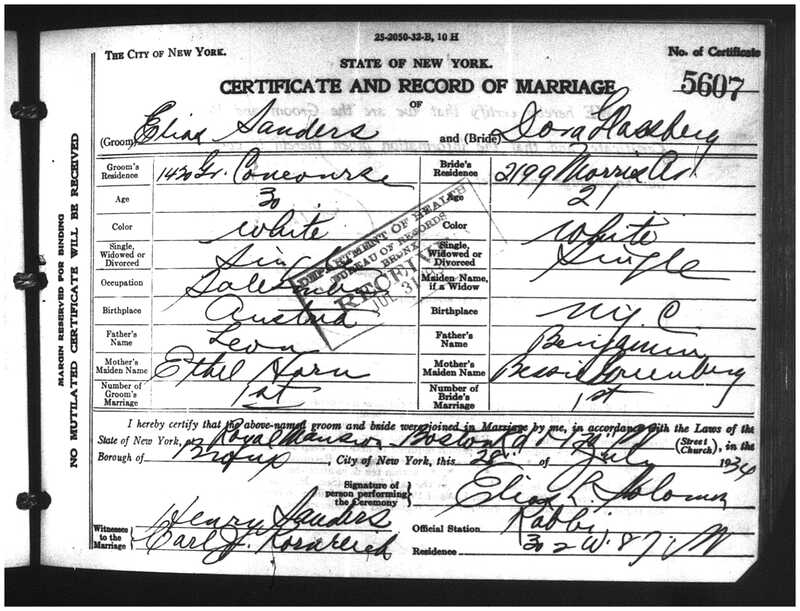 From ItalianGen, I found the marriage of Elias Sanders and Dora Glassberg in 1934, so I retrieved it from the FHL. Elias’s parents were Leon and Ethel Horn. One of the witnesses was Henry Sanders. I continued up this part of the family. Leon and Ethel were clearly Americanized versions of their names, unless they came to America and changed their names themselves. (No evidence was found of this.) And I would be on the lookout for Henry. I followed up on Abraham for a bit at that point. I found him in the 1915 New York State Census at the same address as on the ship list, so I knew I had the right person. He lived with his wife Katie and children, Henry, Ada, Silas, Eli, Manuel, and Rose. I went on to find the 1925 NY State Census, the 1930 US Census, the 1940 US Census (where Abraham was a widower), and eventually the 1920 Census, which took a bit more effort. I also found two passport applications for Abraham, in 1920 (with a photo) and 1908, and a draft registration for World War I. His dates of arrival and naturalization were varied on the censuses, with his arrival 1885 or 1892, and his naturalization may have been 1894, though that census stated “unknown” for his wife’s arrival, making the date less likely to be correct. Either way, it looked like his ship list and naturalization probably would not yield new information if they could be found and verified to be his, since they were so early, so I headed back to Elias Sanders. A general search on Ancestry yielded a ship list for Elias in 1931. He was a US citizen, claiming 1672 Broadway, Brooklyn, as his address. A few lines above him, Henry Sanders, five years older, was claiming the same address. Recall that Henry Sanders was also a witness to Elias’s marriage. It was time to follow up with Henry. I found a naturalization for Henry where he was also living at 1672 Broadway. His declaration listed the name Hyman, so he had changed that along the way. And his certificate of arrival listed his name as Elias Gutman. He arrived under his brother’s ticket? I checked the ship list, which listed the same relatives, and had Elias’s age instead of Henry’s. It also listed his mother as Etel Gutmann, instead of Jetti — but those are the same name. We hear stories of people arriving using other people’s tickets. Here is one. (This is the second I’ve ever found proof of.) Henry used his brother’s ticket, and Elias arrived the next year under his own name. I checked the 1925 NY State Census for 1672 Broadway. There were two families there, but no Sanders. In 1930, one of the same families was still at the address, and they were from Austria, with a son named Elias (recall that Abraham had an Eli/Elias also). Elias is not the most common of names, but it is common for a bunch of Ashkenazi Jewish cousins born around the same time to be named after a relative who had just died. In this case, the three Eliases were born about 1904, 1904, and 1910. So I decided to look into this family who lived at the address that the Sanders brothers kept using. Perhaps the wife was a sister of Elias and Henry’s? The 1925 Census said that Oscar and Rose Wiener were born in Austria and their kids were born in the US. The 1930 Census said they were all born in Austria. The 1925 gave the date of his naturalization, but it wasn’t on Ancestry. Rose and the children all had the same year for arrival, so I looked for their ship list, hoping to find them all together. Ancestry brought me to the page where they were detained aliens and I had to search for the other page, but they were from the same town as Elias Sanders, she left behind “family” Chaye Horn, and they were joining Oscar who was already at 1672 Broadway. I was wondering if this could be a sister to Elias, but this made it look more like a relative on the Horn side. Since they were married in Europe, it could be harder to prove. Searching harder for Oscar’s ship list online, I finally found it indexed on the Hamburg list, but Ancestry was taking me to the wrong page. I reversed the search for the US ship list by searching on the ship name and finally found him mis-indexed. He was also from the same Stopnica and joining brother-in-law A J Horn. At this point, it was clear that Rose was the connection and she was a Horn, not a Gitman. Eventually I found the family in the 1940 census, the one daughter missing and Oscar widowed. A search in ItalianGen left me a few options to find Rose’s death certificate. It was time to switch over to FamilySearch to look for more. I wanted to find the naturalization for Oscar. I checked my naturalization reference guide for Kings County (which was stated in one census) and discovered they were indexed by JGS NY. I found two entries for Oscar Weiner and Wiener. Back at FamilySearch, the catalog said the records were online, but the search didn’t find it and didn’t show me images. I noticed they were browseable and was able to find both. One was the correct one, which also pointed back to the ship list I had just found. He was not born in Stopnica, but Alt Wisnics. The JewishGen Gazetteer couldn’t make heads or tails of that, but the Gesher Galicia more simple list of towns included Wisnicz, which is somewhat north of Stopnica. While still home and unable to get more records from microfilm, I scoured JRI-Poland for anything about this family but I was unable to find any listings that matched any of the people I already knew about, including an Eliasz in the Horn family who probably died between 1902 and 1904. I was really hoping to get back further into the European records but it can’t always be done with the materials in Utah. Stopnica records were only microfilmed for 10 years and the remaining records have not been digitized yet by the Polish archive. Another FHL visit brought on many more records. First, the death certificate of Rose Wiener showed her to be the daughter of Elias Horn and Chaia Goodman, giving me both the person that the Eliases were likely named for and placing her in the family. Because next I found that Abraham Horn had the same parents on his death certificate. A 1940 US Census I’d found earlier for Henry was verified when I found his marriage certificate to Hilda Kornreich, listing his parents exactly as Elias had on his marriage certificate, Leon and Ethel. I also sat at an FHL computer and looked through ProQuest Obituaries. I found obits for Elias and Dorothy Sanders, Henry and Hilda Sanders, and Abraham Horn. No other family members were mentioned beyond those that I already found, other than children and grandchildren for some. I got an unintended head start on the Glassberg family because Dorothy’s obituary listed her siblings. And interestingly, Hilda’s mentioned a sister who married a Glassberg. I wonder if there’s a chance they’re doubly connected through marriages. In the end, I did not find the death of Oscar Wiener, nor was I able to get any Polish records to research the family back. I did find two siblings to Elias’s mother Ethel, though no documentary proof that they are siblings outside of the ship lists stating others were uncle and brother-in-law, and they all have the same surname. I’ve found ship list relationships to sometimes not be correct, but when there are this many that put the family together, I will trust it, unless I find something later that brings it into question. I eventually revisited JRI-Poland and retrieved all of the Gitman and Horn records from Stopnica in the hopes of finding some connection to the names I already had, but they were all for new people. The Polish archive has 1875-1903 and 1906-1909 Jewish vital records, but they haven’t been digitized yet. If there are earlier records in another town, I haven’t found what town it is yet; it’s apparently not indexed by JRI, or none of this family have any vital events registered. That sometimes happens too. Since I mentioned at the beginning the line about going into politics if you want your genealogy done, I thought I’d add in a little something, since that’s seemingly meant to find the skeletons in the closet. I’ve heard Bernie state that his father came to this country with no money in his pocket. (Or did he say with only a nickel? Maybe it was without a nickel. Now I’m not sure.) For the record, the ship list says that Elias arrived with $25. I have heard that the immigrants would claim the amount of money they had and the officials wouldn’t always verify it, but the ship list does state that amount. Outside of being stuck in US records, I found this to be a lot of fun. I look forward to chasing up the Glassberg family next. Update, 3 February 2016: I have been corrected by Renee Steinig in comments. There are two Polish towns of similar spelling, Stopnica and Słopnice. I originally did much of this research several months before posting the article, but I recall having a bit of a conundrum about which town was the correct one. On various documents, handwritten information said Słopnice, while typed always said Stopnica. I believe I did have a bit of outside influence as well from an Internet article. But the 1908 Abraham Horn passport application was clear that the correct town was Słopnice, not Stopnica as I stated in this article, going so far as to say “Słopnice, County of Limanova” for his place of birth. I obviously did not spend enough time with that document — the 1920 was the one that captured my attention with the photo. However, with the correction of the town, there are now no Polish records available to for me to search. The URL of this blog post is http://idogenealogy.com/2016/01/31/bernie-sanders/. Great work, Banai. I was waiting for someone to do this. When Bernie says his father arrived without money, he was probably right. Those immigrants who declared they had nothing were often held for being possible burdens on the country. Bernie’s father was smart to say he had some money with him whether he did it not. Bernie has said he is proud of his Jewish background and that should make us all proud. Thanks for the extensive research. Great work! I found this fascinating. In particular the part about the man arriving on his brother’s ticket. My grandfather did that—he came under his brother’s name, and then his brother arrived a few years later. I was bewildered for a long time, thinking that my great-uncle had traveled to the US twice. Plus I couldn’t find my grandfather on a ship manifest. When I saw his naturalization papers and the date and ship on which he arrived, I realized he had sailed using his brother’s name. But how did they get away with that? Did they not have to show any identification? And why would they have done it? Any ideas?? They didn’t have ID back then like we do now. We have birth certificates, driver’s licenses, and passports that we have to provide for so many reasons. I guess back then it was just their word on who they were. Many births didn’t get registered and some of them didn’t know their own birth dates, or even the correct years. It’s also why they could so easily change their names, with no documentation and nothing official. There was no government database to change, no official ID to change. It was simpler. Thank you! That makes a lot more sense. I had notions of my grandfather (who was two years older than his brother David) carrying David’s papers and then wondered how David had gotten out himself. The other thing that still puzzles me is that my grandfather left when he was turning 16 to avoid the draft, yet his brother was still in Iasi long after he turned 16 and wasn’t drafted. Family myths…are family myths, I suppose. Thank you so much for building Bernie’s Family Tree!!!!! Thank you so much for your research. I have been interested in Bernie’s Jewish and Polish heritage and started doing a web search. I did not find much about his father until I found your link. I have done a fair amount of research myself on my family tracing back to Russia and Germany. I had wondered how the last name Sanders had come from Poland. Now I can see they changed it in this country. Do you have any idea why Henry and Elias chose this particular surname and when they chose it? Knowing why they did things is harder to figure out from records than just finding out that they did them. Usually a family story is the best and sometimes only way to know why. In this case, I was researching without the help of any family or any story. I wanted to know why they changed it to Sanders as well, but I found no hints in the records that I have access to. Perhaps there are other records, probably located in NYC, that might say. I have heard a variety of reasons for people changing their surnames, outside of just simplifying it for Americans, but I didn’t see anything to help me guess which reason they had for this more drastic change. Slopnice is spelled with a “Polish L” — an “L” with a diagonal line through it (and pronounced like an English W). Possibly the shipping line and/or naturalization court clerk copied Elias’s birth place from another document and misread the L as a T.
Unfortunately, Mark Halpern of Jewish Records Indexing-Poland reports that no records survive for Slopnice. Ooops — Slopnice Krolewskie and Slopnice Szlacheckie. Interesting. This issue was near the beginning of my research, which was several months ago. I remember encountering the conundrum of which town. I don’t remember noticing the Horn passport application where it listed all the additional information. I was focused more on trying to find the Gitman line, and noticed Abraham’s photo more than the description of his place of birth. Thanks for sharing the article. I saw it quite a while back on social media but I avoided it so as not to influence my research. I even went looking for it later, but couldn’t find it. But I did end up seeing a shorter English version, which probably did influence me, saying he visited Stopnica and not Slopnice, and that they gave him some records of his family. This Polish article includes the same comment, suggesting some records survived. Maybe only more recent ones that we don’t have genealogy access to. Yes, both Sanders declarations say Slopnice, but one petition says Stopnica, like the ship list, and the other doesn’t list the town. Stopnica is typed in two locations whereas Slopnice is always handwritten. A combination of these things caused me to choose Stopnica over Slopnice. But it seems that if I’d gone the other way, I still would not have found any Polish records, which was really what I was hoping to do. However, you are correct. If nothing else, Abraham’s passport application is abundantly clear that I chose the wrong one of the two towns whose spellings appeared on the records. That is one of the challenges in genealogy, just finding the correct town of origin. And as I stated, I was trying not to use any sources beyond the bit from Wikipedia and my own research. I’ve gotten started on Bernie’s mother’s line and I’m hoping I can get back into Europe on that one. Records for the alleged town of origin for her family are available, but nothing in JRI-Poland is immediately matching what I already know of them. But I am just starting on it. I am interested in knowing more about Dora Glassberg. My grandfather was William Glassberg born around 1890 and they seem to be from the same region. Fascinating stuff. I’ve recently found from online records that my grandfather was born in Nowy Sacz, about 20 miles from Slopnice — all my father ever told me was that he was from Galacia — so I’m finding your research particularly interesting. So they changed their family name from Gitman to Sanders (or did I miss something)? Gitman’s an easy name, odd to change it to Sanders. There was some additional discussion on Facebook after I posted this. In Galicia for a time, Jewish marriages were not considered legal, so children would be given the mother’s maiden name. In this case, Elias and Henry’s mother’s name was Horn, but her mother was listed as Goodman, which was more likely Gitman before it was Americanized. So my theory (partly based on some others’ comments in the discussion) was that the Sanders family actually got caught in that non-legal marriage bind for two generations and had their grandmother’s maiden name. After arriving in the US, they both used their father’s name. Cleaning up my downloads folder it took a bit of time and your wonderful work, above, to remind me that several files I downloaded were from my Bernie research. I have a large folder of research, but never pulled it together. Feel free to contact me privately to consider something we could do more formall ywith all this research, maybe publishing in Avotaynu. On the question of the name origin, the only hint I found was that a branch of the family (?) it seems claim origin from New Sandez. Many people were assigned a shtetl nickname based on their origin (prior to the shtetl where they lived), and that could have followed them to the new country. Thus, if I came from Boston but lived in Denver, I might be called Jimmy Boston, and if I moved to place where lots of my Denver landsman also emigrated to, they might still call me Jimmy Boston. Well, its a theory! Believe me, I want to get it finished. I was waiting for one piece of information, then realized I had access to more records, then realized those records would take a very long time to get through because they are not indexed, and now I’m caught up in RootsTech preparations. I will try to get back to this soon. This is all fascinating- I’m with maxine, move on to the Glassbergs when you can. I think I’ve scratched the surface there- let me know and I can tell you where my tree is for access. Don’t know if this is useful, but my great grandfather was born in Łódź, Poland and was named Avram Baer Sanderowitz (likely spelled differently in Polish but that’s the way I saw it spelled on a wedding announcement from the 19-teens in NYC for his son). His son, my grandfather, was Samuel Sanders, so at some point after 1900 in NY, it was shortened to Sanders by either AB or Sam. Owitz (ovich, owicz) is “son of” and I’ve been told Sander might be a corruption of “Sandlar”: shoemaker.